Just off the Illinois highways, and tucked away in the shadows of the cornfields of the downstate region, is the small town of Okawville. To travel its quiet streets today, one can barely imagine that this once was one of the most bustling little towns in southern Illinois. However, from the late 1800's through the middle part of the Twentieth century, people came here from all over the country to take in the almost magical waters of the mineral spring that still exists beneath this town. During its heyday, a number of cheap hotels and health resorts existed here, offering healing baths to those who suffered from rheumatism, digestive ailments and all matter of illnesses, but today only one still remains. 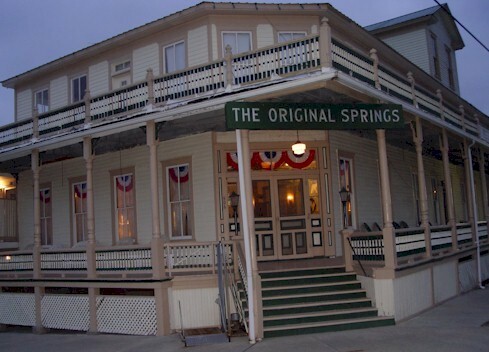 The Original Springs Hotel is still resting on North Hanover Street in Okawville and today, is the only continually operating mineral spring in the state of Illinois. It is a place of both history and mystery that still draws people from the surrounding area and beyond. They continue to come here hoping to experience not only the rejuvenating waters of the old spring but the strange and powerful aura of the place itself. When Dr. McIlwain heard about the test, he made arrangements to have one his rheumatic patients, who was not responding to any other treatments, come bathe in the water. The man was almost immediately cured. Within a short time, Plegge got in touch with a German farmer who had once worked at the Carlsbad Baths in his home country and together, they established a small bathhouse, which opened on September 16, 1868. The business prospered on a local basis and was enlarged several times. However, it was never really promoted outside of the immediate area and Okawville (called Bridgeport until 1871) was not really prepared to handle crowds of visitors. The town had a population of only about 600 at the time and few places to eat or shop. In addition, there were only a handful of rooms in various boarding houses available and they were best suited for overnight stays by traveling salesmen than for visitors making extended visits. Another drawback at that time was the lack of transportation. It was very difficult to get to the small community before the coming of the St. Louis & Southeastern Railroad in 1871. By 1872, it only took an hour to reach Okawville from St. Louis by train and at this time, several small hotels did spring up, including the South Okawville Hotel and Henry Klauke's hotel, general store and saloon. The Okawville House, a boarding house and saloon, opened on North Hanover Street in 1873 but none of these buildings offered bathing facilities for the mineral springs. Rudolph Plegge dreamed of building his own three-story brick hotel for several years and in 1875, began piling up sand to get a foundation started but the project never got off the ground. He did increase his bathing business during the 1870's but it would not be until the latter part of the 1880's that someone would combine the hotel, restaurant and bathing business to change the face of the town forever. At some point in 1884, the wife of Reverend J.F. Schierbaum of Edwardsville came to Okawville to take in the waters. At that time, she was said to have been a hopeless invalid and had visited all of the best doctors in St. Louis, who offered her no relief from her pains and ailments. She came to Okawville, bathed in the water and was restored to perfect health. She was so overjoyed that she convinced her husband and several other ministers in the German Evangelical Church to buy Plegge's business and build a hotel on the site. The expansion of the hotel helped the entire town to prosper. A livery stable was built in town at the corner of Front and Third Streets and operated horse-drawn "buses" for many years, bringing passengers and their luggage from the train station to the Mineral Wells. By 1887, there were two separate companies providing this convenience. The new arrivals helped other businesses to also thrive. William Friedman, who operated a saloon and dance establishment called Apollo Hall, also opened a recreation area called City Park behind the nearby City Hotel. The park featured nightly band concerts in the summer time and was said to be "patronized by best society as well as the Mineral Wells guests." In 1890, the Mineral Wells Hotel was sold to J.W. Schreiner of St. Paul, Minnesota. He had earlier journeyed to Illinois to take in the waters and was so relieved of his problems with rheumatism that he offered to buy the hotel and bathhouse. He and his brother, W.A. Schreiner, took over the operation and it began to grow. J.W. Schreiner became very much involved with the local community and served as the fire chief and later, as Okawville's mayor. In 1891, the Schreiner's wanted to try and exceed the 9,000 baths they had given during the previous season and so they enlarged the bathhouse building to double its capacity. They had another hugely successful season but then in November, after the closing of the hotel, disaster struck. During the early morning hours of November 8, a horrific fire swept through the building and reduced the place to a crumbling ruin. The fire was blamed on an exploding lamp but to this day, the true cause of the blaze remains a mystery. However, in 1892, word spread that the fire had actually been the result of arson. Apparently, someone had borne a grudge against the former owners of the hotel and not realizing that it had been purchased by the Schreiner's, had broken in and had spread coals from the furnace about on the wooden floors. Whether this story was true or not has never been discovered. The fire did not set back the Schreiner brothers for long and they made immediate plans to rebuild the hotel before the next spring and summer season. The blackened remains of the old hotel were cleared in December and sand and brick was hauled in for the new foundation. Work was started on the bathhouse first was mostly completed by February 12. The new structure was two stories high with an extra room across the center of the upper floor to contain large, hot and cold water reservoirs. The bathhouse contained 40 rooms but the planned hotel was expected to be much larger. By May, that building has also been raised and was expected to be ready for the June rush. They made it - but just barely. The hotel was completed by June 10 and opened soon after and as one newspaper put it "and none too soon either, for the irresistible flood of bathers is coming rapidly and taxing the capacity of hotels and boarding houses here." A grand celebration was held in July that combined the Independence Day holiday and the re-opening of the Mineral Wells. The placed was booked to capacity, as were other local hotels and private homes that seized on the popularity of the town's mineral baths to make some extra money renting out sleeping rooms. The Mineral Wells continued to do huge business that season and in the seasons to come. Unfortunately though, the fire had actually been helpful to the Washington Springs Hotel, which had been open during the time that the Schreiner's were rebuilding. This establishment's business was also booming and in March 1894, M.A. (Alex) Morgan leased and then purchased the Washington Springs Hotel & Bathhouse from Gottleib Rolf. 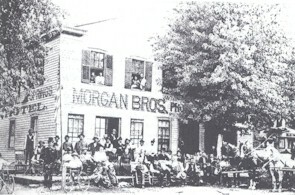 Morgan was a backer of a local coal mine and two years earlier, had planned to open another hotel alongside Morgan's Lake in town. This plan fell through and so he decided to purchase and improve upon the Washington Springs instead. Morgan and his brother Andrew began promoting the business so successfully that they soon made plans to build a larger hotel building. The following month, the Mineral Wells Hotel changed its name to a variation of the one that the place still has today - the Original Okawville Mineral Springs. It began to appear this way in all of its advertising. With the new competition that was coming on the scene, the Schreiner's wanted to make sure that everyone knew that their hotel and bathhouse had been in town first. The ads continued to trumpet the healing benefits of the waters at the Original Springs, as opposed to the inferior qualities of its imitators. Of course, as most readers have already guessed, the water all came from the same mineral wells. The Washington continued to thrive under its new ownership and near miraculous cures began to be reported in the newspapers. The free advertising that came from these newspaper reports brought even more business to the hotel. The Washington also had another advantage over the Mineral Springs in that it offered something for its patrons to do during the evening hours in the sleepy little town. Other than drinking in a local tavern, which did not interest most who came to Okawville for health reasons, there was very little entertainment in town. With that in mind, the hotel owners turned Morgan's Lake into a private amusement park for their guests, offering boating, fishing and dancing in a large pavilion that had been constructed at the lakeside. Later on, other businesses began catering to the visitors during the evening hours and an opera house was opened, along with an ice cream parlor and the Rex Theatre. Throughout the off-season of 1894-19895, the Morgan's continued to expand and improve on the Washington Hotel. Perhaps the greatest of these improvements was the installation of electric lights, the first to be installed in Okawville. The announcement was made that the new hotel building would contain 300 incandescent lights and in February 1895, the hotel was opened to the public. According to the newspaper report of the celebration, "the new Washington was flooded with a blaze of glory". 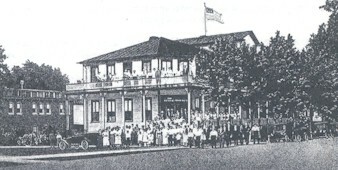 The hotel opened for the 1895 season in April and enjoyed its greatest success so far. The summer was a blur of band concerts, dances, ice cream socials and boat rides and at the end of the season, the lake and the park were also illuminated with electric lights. The Washington Hotel's progress and success did not sit well with the owners of the Original Springs. In the spring of 1896, they also wired their buildings with electricity and naturally, installed larger equipment than their competition had, with machinery capable of lighting 500 incandescent bulbs and a dozen arcs. Before long, most of the businesses on Hanover Street were lighted by electricity from the Original Springs and a few years later, the hotel even provided street lights for the city. The owners of the Washington, always looking for something to stay ahead of the Original Springs, introduced a concept in 1898 that had not been previously tried - bottling the water from the springs. Not long after the introduction of a small bottling operation, water was being shipped off to St. Louis in a specially-built wagon. Later, it was also carried by train and received quite a following in the larger city. The water would remain popular for years and bottling done by the Original Springs would last until the late 1980's. At that time, the health department stated that the water could only be bottled if it was done in a separate building from where bathing took place. The owners decided that it was not worth the expense and so the bottling was discontinued. However, if you do visit the Original Springs, I encourage you to drink as much of the water as you can. In addition to its restorative powers, it boasts an unusual taste and texture that my friend Brady Kesner said was "like drinking air." Rev. Schierbaum immediately began working to continue the improvements at the Original Springs. In December 1900, he made arrangements with the village board to provide water to sprinkle the town's dirt streets with in the summer months and began enlarging the nearby Schulze Mill pond, which provided water for the boilers at the hotel. The pond would be used for recreational activities for the guests. He also put in a larger electric generator plant and agreed to furnish Okawville with 40 street lights over the next 10 years at a cost of $600 per year. According to newspaper accounts, 1902 was a banner year for Okawville. The spring and summer season had passed with the hotels being filled to capacity, the bathhouses always busy and the local businesses making plenty of money from the steady stream of visitors. "Okawville's fame is constantly growing" the newspapers stated, "and the growth of the village is steady and sure, while not in any sense a boom." The early 1900's were an era of further expansion for the Original Springs and Washington Hotels. More additions were constructed and other businesses, like ice cream parlors and theaters, prospered during this period of growth. The Original Springs built a large addition that was two stories high and contained 24 new guest rooms in time for the 1907 season. This addition can be seen today starting from where the porch ends and inside, takes the visitor up a short flight of stairs to a slightly higher level. One of the most highly praised features of the addition was a large dining room that was located in the basement. The room featured highly decorated tin walls and extravagant decor and became quite popular. Around 1910, the owners attempted to turn this part of the hotel into a gambling parlor but their license was denied by the village board. While the Washington was constructing this new, but rather ordinary, bathhouse, the owners of the Original Springs were also hard at work. The old frame bathhouse here was moved to the southeast corner of the lot and constructed was started on a new brick bathhouse, which still exists today. The local brickyard had to work around the clock in 1910 to provide enough bricks for the construction. The hotel was forced to make do with the old bathhouse until the new once could be completed, about halfway through the following season. At the end of the 1911 season, another big construction project took place at the Washington Hotel. The owners tore down the old bathhouse building, which had also been the first hotel building, and built a three-story addition that was dubbed "The Annex". The hotel now extended from one end of the block to the other but this was as large as it would ever get. The owners had no idea at the time that the days of the Washington were numbered. Business continued to be brisk during the 1911 season for the Original Springs as well but in October of that year, Anna Schierbaum died after a lengthy illness. She had been managing the hotel since her husband's death and it fell to her son, Ben, who had been a clerk for several years, to take over. The following year, Ben married Alma Schulze, the daughter of C.L. Schulze, who operated a store in the brick building across the street from the hotel. Their marriage was apparently a rocky one and while no details of their troubles have been found, Alma left Ben in November 1916, not long after the hotel closed for the season. Not having any idea where she had gone, he spent several days searching for her, ending up in Shelbyville. After about three days, he returned home, dejected, and late one evening went to see her parents at their store across the street. They were unable, or unwilling, to help the young man and he returned to the empty hotel. Startled, he looked to see a man, who would later be identified as Ben Schierbaum, slumped against the wall. Blood was sprayed all over the hallway and a good portion of his head was missing. In his lap was a double-barreled shotgun and next to it was a curtain rod that had been used to pull the trigger. Several letters and his wife's photograph were lying on the floor. Nearby, out of reach of the blood, was a letter that had been written to his father-in-law, Mr. Schulze, asking him to call the coroner and his brother Dan, and then to "forget the whole matter". Ben had taken his own life in despair over losing his beloved Alma. The town of Okawville enjoyed a period of great prosperity over the course of the next several years. The modern transportation of visitors from the train station to the hotels came about when the local livery man, Charles Mohr, purchased a new International truck chassis and had a wagon maker build a body that would carry 16 people. This sounded the death knell for the horse-drawn wagons that had been used in years past. But the event that occurred that really put Okawville on the map took place in 1919 and then was repeated again in 1924 and 1928. These years were the annual conventions of the "Egyptian Hustlers", which were held in various towns in southern Illinois every summer. The Egyptian Hustlers were an organization of traveling salesmen and businessmen. They took their name from "Egypt", the popular name for Southern Illinois and they "hustled" products for mostly St. Louis companies. When they came to town, hotels filled, there were dances and stage shows, carnivals and meetings and nearly something going on every minute. Crowds and automobiles came from all over the region and while as many as 30,000 were expected the first year, the attendance was slightly smaller because of rain. Even so, the throng literally overflowed the town on every occasion and later conventions brought a circus, a miniature world's fair and even airplane rides to town. The years that followed were times of declining business for the bigger hotels. The Original Springs did not open until July in 1921 and a fire badly damaged the Washington in 1923. A year later, a corporation was formed in St. Louis that took over the two hotels, as well as the Okawville Light & Ice Plant. They announced plans to build a third hotel but this never came to pass. The highlights of the next few years were the return of the Egyptian Hustlers in 1924 and a conference that was held in October of that year by the Southern Illinois bankers. Business had been tapering off otherwise though and a hint of wistfulness emerges in a newspaper report from the July 4 festivities in 1925. The reporter commented that the weekend at the big hotels "looked like old times with the crowds". In 1926, two St. Louis bank robbers were captured at the Original Springs. They were recognized by an off-duty Madison police officer who was staying there and he called the St. Louis authorities. But they would not be the only criminals to come to the Original Springs and were certainly not the most famous. In the middle part of the 1920's, the Original Springs was a frequent meeting place for infamous Southern Illinois gangsters Charlie Birger and the Shelton brothers, Carl, Earl and Bernie. The men would later declare war on one another and engage in a series of bloody battles and assassinations in the region. However in 1923, they joined forced to oppose the Ku Klux Klan, who had moved into the area to crack down on bootleg liquor, which Birger and the Shelton's all dealt with. Charlie Birger's base of operations was in the southeast part of the state but the Shelton's were based around East St. Louis, which made Okawville a worthwhile meeting spot. It's also likely that the hotel managers were customers of the Shelton brothers because it is believed that alcohol was available here throughout Prohibition. 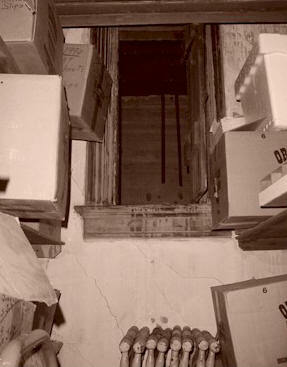 The current owners have discovered a trap door and a hidden room in the lower part of the hotel where it is believed that liquor was hidden. Claude Monroe, a hotel employee who is now in his 90's, recalls the days when the Birger and Shelton gangs met at the Original Springs. "They were nice guys," he said, "as long as you didn't make them mad." He remembered how the gang leaders would meet in the bathhouse and avail themselves of the massages and baths that were offered. However, when they did meet there, they always met alone, commandeering the entire bathhouse for their own use. Men with submachine guns were always stationed outside the door and at the end of the walkway that led from the hotel to the bathhouse. In 1928, the Egyptian Hustlers returned to Okawville for the last time but the event now held little fanfare. The much smaller convention was held at Kugler's Park and while it did offer a carnival, contests and other attractions, the crowds were certainly not as large as in years past. Interest in the mineral springs seemed to be waning, although the hotels still managed to fill up every weekend. The biggest change however was the conversion of the Original Springs into a country club. Lifetime memberships were sold for $100 each and nearly 300 people joined, mostly from St. Louis. Paeben purchased a bus, which made trips to St. Louis every day and brought club members and their guests to and from the city. The influx of cash made it possible to update the decor of the hotel, add new paper to the rooms and to put in a hardwood floor in the dining room. Additions were made to the bathhouse, including the installation of Burdisch "American Special" (Turkish) bath cabinets. The hotel as a country club opened on May 1, 1930 and plans were set in motion for a golf course and tennis courts. These things never happened, but a short lived miniature golf course existed for a time in the hotel yard adjacent to the bath house. Despite the worsening Depression, the Original Springs was in the midst of a business boom. Paeben's shameless promoting of the country club on radio stations and in print, using the phrase "Where Rheumatism Meets its Waterloo", brought in large crowds from St. Louis and the surrounding area. The hotel was constantly filled and over 3,000 baths were given during the 1930 season, using more than 225,000 gallons of the miraculous water. An additional 250,000 gallons of the water had been softened and used for washing, cooking and assorted uses in the hotel. This water came from two bricked and arched reservoirs, which are now located under the floor of the banquet room at the north end of the swimming pool. One can still find the access to the reservoir by tapping your foot on the floor of the banquet room and listening for the hollow sound. Sadly though, after only one year, the country club failed. In 1931, the hotel changed its name to the Original Springs Health Resort. The country club seemed to have been a good idea but it could not have come at a worse time for the nation's, and the region's, economy. It continued to exist as a social organization and some special privileges were afforded to members for some time afterward. More evidence of the worsening Depression was shown by the fact that the old bathhouse at the corner of the lot, which contained about 20 rooms, was renovated into rooms for those who were unable to afford the regular rates at the hotel but who still wanted to take in the waters. Several cottages were also built with this same plan in mind and were located on the property for a number of years. By 1933, things were very bleak in Okawville. On March 23, an announcement was made that there would be a trustee's sale of fixtures from the Original Springs Health Resort, although an April 13 issue of the newspaper stated that the sale had been withdrawn, pending negotiations. Things did not improve and in May, Conrad Paeben committed suicide by poisoning himself. The management of the hotel was taken over by two of its employees, Tom Rogers and Louis Elardin. With the help of W.G. Frank, a local banker and the head of the organization that controlled both hotels, they were able to keep the hotel open. Later that year, they changed the name back to the Original Mineral Springs. Tom Rogers, who had come from Chicago and had joined the staff of the hotel in 1931 as the chief clerk and auditor, was both community minded and an astute businessman. He wrote editorials for the newspaper and gave lectures on improving business and tourism in Okawville. He would later gain a reputation for being rather eccentric, but that would be in some time to come. At this point, he wanted nothing more than to bring in more people for the hotel and in February 1934, he began a series of Saturday night dances that were well-received by visitors and the community. The dances began at 9:00 p.m. and ended at 1:00 a.m. so that the hotel guests could "retire without disturbance". After the dance ended, the club rooms were opened for those who wanted to stay awhile longer. Beverages were also served and there was no specification as to what those beverages were, although advertising for the events assured everything that "nothing will be permitted that would offend the most particular or be objectionable to any citizen of the community." Later that spring, the Original Springs Orchestra also began providing musical entertainment and beer was free for those who paid a 45 cent admission. A woman from St. Louis was hired to direct the orchestra and later, a floor show was also added. By July, the hotel was reporting record crowds on weekends. Rogers also dabbled in farming and hog raising at his Original Springs Farms. Louis Elardin, who had once shared management duties with Rogers at the hotel, had gone into the tavern business but lost all of his money. He became an employee of the farm and Elardin and another permanent hotel resident and employee, Tony Hilleke, farmed with old equipment on Rogers' acreage and did routine tasks around the hotel. Both men managed to outlive Rogers and spent their lives at the hotel, even after a later change in management. In the 1940's, Rogers seemed to be more interested in his other business pursuits than in the hotel business and he did little to promote the Original Springs. He was content to develop his dairy and to raise nearly 800 hogs on his farm north of town. Despite Rogers' waning interest, the hotel boasted record crowds on weekends. During the week, it was another story though. World War II was the focus of most people's attention at that time and various shortages kept people close to home. Many of the rooms at the Original Springs were not opened and the corridors and dining room remained mostly empty. The Washington Hotel had suffered even more during and after the Depression and during the war . It was not opened at all for the 1942 and 1943 seasons and it was finally sold to the Cohn Brothers in 1944. They did some renovations, with plans to keep it open all year round, but this did not take place until 1946, when a new heating system was finally installed. That same year, they built a new kitchen and added a coffee shop that was open to the public. New beds were installed in all of the guest rooms and a new neon sign was placed over the entrance. Things seemed to be going well but then in 1949 came a startling announcement - the Washington was being converted into a nursing home. At first, just the main floor was converted and the second floor was available for hotel guests, but this did not last long. Soon, the entire building was changed over and for a time, it was the largest privately operated nursing home in the state. Known as the Washington Springs Nursing Home, the facility operated until 1976, when changes in the Illinois fire codes forced it to close. Sadly, the still sound building was torn down in 1977. When the Krohne's took over the place, it had not been changed or updated in years. The only modern convenience in the rooms was a single light bulb that hung from a cord in the center of each room's ceiling. Communal bathrooms were located on each floor. With funds available for renovations, the Krohne's went to work. Some of the rooms were equipped with sinks and toilets, although usually just by partitioning off a section of the room, but others were equipped with showers. For several years, there were three categories of rooms to let at the hotel, good, better and best. The good rooms had no facilities. The better rooms had a sink and a toilet and the best rooms had showers. Tubs were later added to the "deluxe" rooms and priced accordingly. In 1972, excavations were started for the swimming pool. For some time, it was an outdoor pool that was used during the summer months only but it is now enclosed and kept nicely heated all year round. The Krohne's stayed at the Original Springs until the summer of 1974, when they sold out to Robert and John Schrage, who stayed for only two years. The Krohne's got the place back from them in 1976. More additions were made to the hotel in the 1980's. A section of rooms, as well as banquet rooms, were added to the hotel in 1980 and the pool was enclosed at this time. When the work was being done on the pool, a recreation area was built and for the first time, the bathhouse and the hotel buildings were completely connected. Before this, only an enclosed hallway, supported by pillars connected the main floor of the hotel with the second floor of the bathhouse. It was in this hallway where the guards had been stationed during the days of Charlie Birger and the Shelton Brothers and also where Ben Schierbaum had shot himself to death years before. It should also be mentioned that a portion of the roof above the pool had been designed to that in warm weather months, it could be opened with a motor and cable apparatus. The mechanism never worked quite right and has not been opened since at least the early 1990's. The last major construction, aside from remodeling and renovation, took place in 1985, when 10 rooms were added to the hotel. In addition, three club rooms were added on the first floor of the bathhouse to create desirable pool side rooms. The last change in ownership for the Original Springs occurred in May 1990 when the Krohne's sold out to the present owners, Don and Mary Rennegarbe. Since taking over the building and continuing to the present day, the Rennegarbe's have worked to restore the building to its former glory. Their work has been ongoing and often laborious but it has resulted in keeping the hotel open and its wonderful bathing facilities still accessible to the public. The Original Springs has weathered fires, the Great Depression, suicides, changes in management, two world wars and the changing tastes of the American people and through it all, the hotel still stands as a monument to the past. Even today, people come here from all over the region to take in the healing Okawville waters and to soak up some of the ambience of days gone by. Healing waters and good food are not the only things that people come here looking for either - some come looking for ghosts. And thanks to the unusual history of the hotel, and the colorful parade of characters who have passed through it, ghosts are something that many of them find. Don and Mary Rennegarbe heard the rumors and stories almost as soon as they took over the aging hotel. Staff members and desk clerks started to tell of strange noises that they heard in the building at night, including pacing footsteps in otherwise empty hallways, figures that were sometimes seen out of the corner of the eye, doors that opened and closed by themselves, the tinkling sound of old-time music that echoed in the corridors and as one of the employees recently told me, the constant feeling "of someone watching you." No more than 30 minutes later, Nicole excitedly woke her up. She urged Mary to look up and see something that was in the corner of the room. Whatever it was, Nicole said that it was flying up near the ceiling. Mary squinted in the dimly lit room but could see nothing. Her daughter was very excited though and could obviously see something - but what? She pointed at the figure and told Mary again and again to look at it. What was it? She was unable to say. Mary asked her, was it a boy or a girl? No, Nicole simply said, it's gone. Mary was a little bothered by it but finally just dismissed the whole thing as a bright child's active imagination and went back to sleep. About 45 minutes later though, Nicole nudged her awake again and exclaimed that "it" was back. Mary could still see nothing in the corner where the girl was pointing, so she asked more questions. Was it happy? Was it sad? No, Nicole replied, it wants to play. Moments later, according to the girl, it disappeared. Mary managed to go back to sleep after that but questioned Nicole about it the next morning. By that time, the little girl remembered nothing from the night before and she never spoke about the weird incident again. Mary did not forget about it though - especially after the staff members began talking about ghosts. Not long after taking over the hotel, Mary set up her office in the part of the hotel that was added in 1980, just behind the swimming pool where the recreation area was located. The office was up on the second level and a balcony stretches across the front, just above the pool. 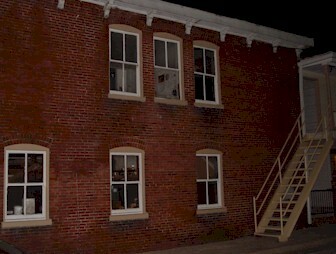 It was on this balcony that guests and employees alike began to report sightings of a spectral woman in a white dress. She was described as wearing a long dress with a high waist and a hat that was in the fashion of the early years of the 1900's. She was sometimes seen standing or in a rocking chair that was located there but no matter how she was seen, her face was always shadowed by the hat and remained unrecognizable. The sightings near this part of the hotel continued for several years and then ceased at about the same time that Mary moved her office to a room that is located just off the lobby. Within a short time of moving into her new office, Mary was working late in the hotel one night. She had just closed the restaurant and was sitting behind the desk with the clerk who was on duty. They were quietly talking when they heard a door open in the main corridor. Glancing out, they saw a man in bed clothes come out of the room that was just down the hall from Mary's office. The room has been dubbed the "Civil War Room", thanks to the themed decor, and Mary recognized the man as having checked into the hotel with his wife a few hours before. The man stepped out into the hallway and looked around in bewilderment. Finally, with a puzzled look on his face, he walked up to the desk and asked Mary and the clerk a strange question for so late at night - had they seen a woman in the hallway? They told him that they hadn't and asked him what was wrong. The man explained that he had been lying in bed with his wife when he began to have the uncomfortable feeling that someone was watching him. He finally sat up and looked around the shadowed room to see a woman standing near the end of the bed. She was wearing a long, white dress and had a large hat on that hid part of her face. She stood there for a moment, looking at him, then she turned and walked toward the door. She never hesitated before passing right through it! The man refused to believe his eyes and he ran to the door and looked out into the corridor, believing that he would see a flesh and blood person walking down the hall - but it was empty. Since that time, the woman in white has been seen again in this same room and has also been spotted in the hallway outside of the room. It should be noted again that this room is located right next to Mary's office and it has been suggested that this is the explanation for why the ghostly figure appears here. She was once seen near Mary's office in the other part of the building and seems to have followed her to her new office space just off the lobby. Could there be some sort of connection between them? Perhaps - but the ghostly woman has been seen elsewhere too. One afternoon, a food delivery driver came into the restaurant while Mary was working. He was a regular driver on the route and came to the Original Springs, traveling between St. Louis and Indiana, on a weekly basis. That day, as he came in, he asked Mary who the woman was that he saw looking out the window on an upper floor? She told him that no one was up there that day but he insisted that he had seen a woman in a white dress and hat looking out at him. Mary asked him where he had seen her and he took her outside and pointed to three windows that are located on the north side of the bathhouse. The woman, he said, had been looking out the one in the middle. As Mary told me later, there should not have been any woman looking out of that particular window, since it was in the men's bathhouse. A quick check revealed that the bathhouse was empty and the window where the woman was seen was a locked storage room on the men's side of the building. The strange incidents and eerie sightings continue today. Many of the staff members at the hotel refuse to go upstairs and into the older wing at night. 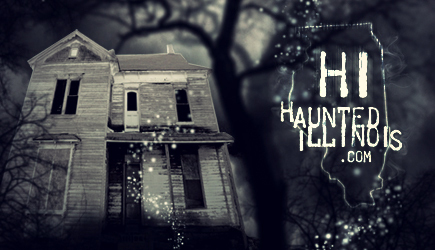 They have often heard strange noises in some of the locked rooms, as well as footsteps tapping in the hallways. One particular area that most find unsettling is a section off the second floor corridor that is currently being converted from three small rooms into one large one. It was in one of the old rooms where a guest was staying one night and asked to be moved to another floor. He claimed that he heard whispering voices and felt uncomfortable cold spots moving into bed with him. Coincidence or not -- one of these rooms was where former owner Tom Rogers was found dead back in March 1962.
Who haunts the Original Springs Hotel? Could the figures seen here, as well as the odd sounds that are heard, simply be memories from the past, repeating themselves over and over again? Or could there be conscious spirits from the glory days of the hotel, simply refusing to cross over to the other side? Might Ben Schierbaum, Tom Rogers or other characters from the building's history still be lingering here? And if so, who is the mysterious woman in white who has been seen on numerous occasions? Perhaps she is Alma Schierbaum, Ben's wife, still haunting the hotel where her husband met his tragic end --- trapped by guilt over having been the reason for his death. The haunting of the Original Springs may be any one of these things but I believe that it is actually all of them. There is certainly reason for some of the people from the hotel's past to still be here, as well as a rich history that has invited these personalities to never leave. It's possible that the energy contained in the hotel's famous water makes it possible for this spirits to manifest. They draw from it what they need to make their presence known, interacting with guests and staff members. In addition, I also believe that the magnetic qualities of the underground water here have served to make the hotel into a giant "storage battery". 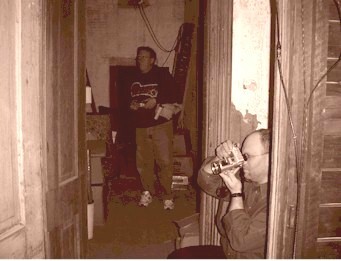 The atmosphere of the old place has been soaking up events, sights and sounds for many, many years and as with any good "residual haunting", these events replay themselves over and over again like a recording. As most locations of this type, the hauntings tend to fade away over time but at the Original Springs, this is unlikely to happen. The secrets of the hotel are connected to its enigmatic water, drawing both the living --- and the dead - to its door.